Have you ever dreamed of flying, but lack the funds to buy your own airplane, the time to learn, or the whole hangar and airstrip thing? The answer might be in a class of ultralight aircraft called powered paragliders, which consist of a soft inflatable wing and a motor on your back. As you may have guessed, the motor is known as a paramotor, and it’s probably one of the simplest powered aircraft in existence. Usually little more than big propeller, a handheld throttle, and a gas engine. But not always. The OpenPPG project aims to create a low-cost paramotor with electronics and motors intended for heavyweight multicopters. It provides thrust comparable to gas paramotors for 20 to 40 minutes of flight time, all while being cheaper and easier to maintain. The whole project is open source, so if you don’t want to buy one of their kits or assembled versions, you’re free to use and remix the design into a personal aircraft of your own creation. It’s still going to cost for a few thousand USD to get a complete paraglider going, but at least you won’t need to pay hangar fees. Thanks to the design which utilizes carbon fiber plates and some clever hinges, the whole thing folds up into a easier to transport and store shape than traditional paramotors with one large propeller. Plus it doesn’t hurt that it looks a lot cooler. Not only are the motors and speed controls borrowed from the world of quadcopters, but so is the physical layout. A traditional paramotor suffers from a torque issue, as the big propeller wants to twist the motor (and the human daring enough to strap it to his or her back) in the opposite direction. This effect is compensated for in traditional gas-powered paramotor by doing things like mounting the motor at an angle to produce an offset thrust. 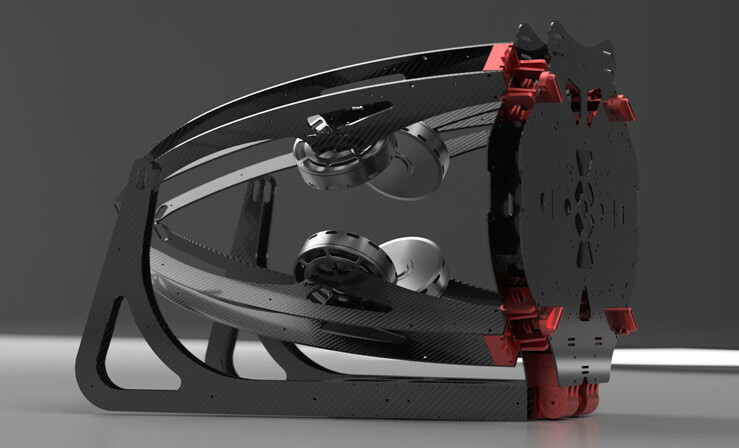 But like a quadcopter the OpenPPG uses counter-rotating propellers which counteract each others thrust, removing the torque placed on the pilot and simplifying design of the paraglider as a whole. If you still insist on the fixed-wing experience, you could always get some foam board and hope for the best. Paraglider and Paraplegic sound too frighteningly similar. Coincidence?. . .
How did they do that, collapse the chute? Or run out of “up” over something hard and lumpy? Following safety protocols and using common sense will avoid most incidents, flying in windy conditions, flying too close to obstacles, too close to the ground, making dangerous maneuvers all contribute to accidents. And just to make matters worse, much of the thrill of flying is most effective close to obstacles and close to the ground. All it takes is to look at a few YouTube videos to see why people are getting maimed or killed. Many of the most popular ones involve very dangerous flying. Everybody tells you they would never fly without a reserve parachute, but this does you no good at all if you’re kicking the treetops. Fortunately, powered paragliding is much, much safer because having a motor makes it possible to fly in calm winds. What is the run time? And what is your static thrust? Your launch looks very similair to my polini 130 in regards to climb out. Wind from the side easily collapse the chutes. No it doesn’t. That doesn’t really even mean anything. Once you are in the air, the wing doesn’t really care about the air’s motion relative to the ground. Ever heard of gusts? It’s the instantaneous wind direction that matters. Flying a paramotor in turbulent conditions is considered a no-no. ..which takes us back to the original comment. Wonder if this rig could also make a better autogyro, they have some thrust angle issues that have a tendency to make handling “interesting” and phasing in full throttle to the bottom motors before the top two could make them a bit safer I think. Very cool. But just to quantify things it’s about $3200 for the actual OpenPPG, $500 for the harness, $900 for the batteries, and $3300 for a parasail. Total cost to fly is probably around $8000. And then unlike a gas one you have to wait to charge the batteries after every flight or spend an extra $900 for another set. But then again it may all be worth it for the lack of gas engine maintainence. …and most of all, the lack of noise! “Less” noise. They are not silent.